Well, with this app you can disable internet connection for a device on the same network. So if someone (anyone) is abusing the internet wasting precious bandwidth for a Justin Bieber videoclips you could just kill their connection and stay happy with a full bandwidth just for yourself. Grabbing traffic, showing websites visited by grabbed device. 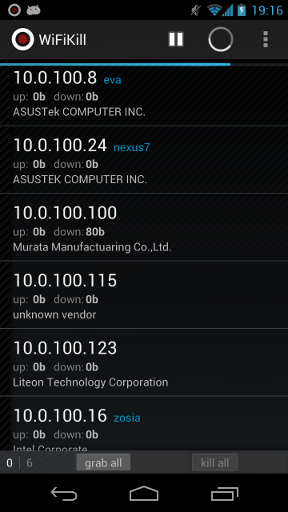 Showing bytes transferred by grabbed device. For more info, visit forum.ponury.net. Thanks, now i can control mt network. Is it normal dt i cant see visited site by my targe?. i try it to my sister phone but it seem its not working. Cant install this app, as well as on TB v5, cause both are on .txt extension. If i renamed it on .apk, Cant open it either. Please help! as well as on .rar/.zip :3 PLEASE HELP!! I have a HTC Sensation XE. When you install this program, we throw an error: "Unable to start service, do you have root?" What's the problem? thank you do you have root?" I have tried this Android App. And I enjoyed it alot. Hi there! I just would like to give an enormous thumbs up for the good information you’ve got here on this post. Nice share actually. Now you can ask any android problems and get live solution at ChatCat live chat support. Its really amazing. I have solved a many problems there regarding my android games problems. to run this app we must root phone? I have root in my Nexus 4 (lollipop, version 5.1), but when I try to use the WiFilKill appears this message "unable to start service, do you have root?" ... Well I have root, so what's the problem? Work only for android v4+. See the apk detail.